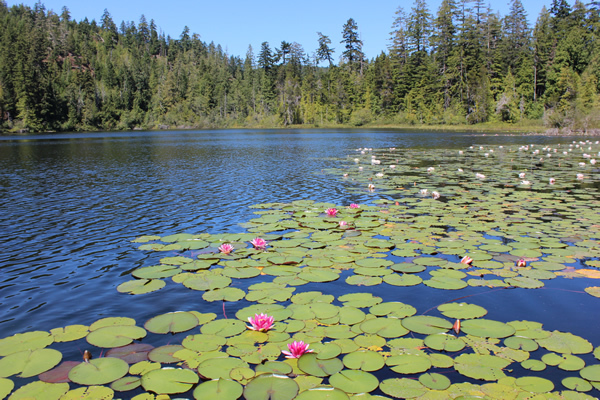 Pink lily pads at Crabapple Lake in Sooke. Photograph by Adam Ungstad. Admire wildflowers on your way to a spectacular viewpoint, and take a refreshing swim in a freshwater lake on the way. Watch for abandoned cars covered in moss hidden in the trees as you hike through mid-growth forests of Douglas fir, arbutus, sword ferns and salal berries. From following an old logging road up to the secluded Crabapple Lake in the Sooke Hills to enjoying a picnic on the highest peak of the Saanich Peninsula between Fork Lake and Durrance Lake, you don’t have to go very far from Victoria to find a great trail for a day hike – and what could be a better than finding a lake on the way! Full of trail maps, photographs, history and top ten lists, this 152-page book will give you plenty of new hikes to explore, places to discover, and lakes to swim in while you are out there. 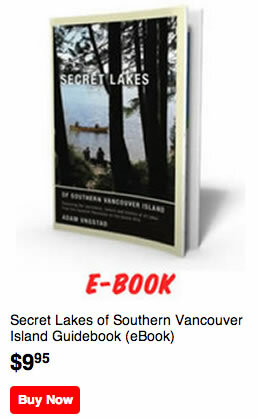 The Secret Lakes of Southern Vancouver Island Guidebook is a fantastic resource for anyone hitting the trails, from beginners to experienced hikers.